Employers added 165,000 to payrolls in April, pushing the unemployment rate down to 7.5% from 7.6% -- the lowest rate since December 2008. Economists had expected the rate would remain unchanged from March and payrolls would grow by 145,000. In the latest jobs report, as in many previous ones, government payrolls fell, declining by 11,000, while private payrolls rose by 176,000. Manufacturing payrolls, however, were unchanged. Payroll gains for March were revised upward to 138,000 from 88,000 and for February to 332,00 from 268,000. Despite the better than expected numbers, William Dickens, professor of economics and social policy at Northeastern University, says today's job report is basically "more of the same." He tells The Daily Ticker, "We've been in a very, very slow recovery now since 2009 and what we've been seeing is a very, very slow decline in the unemployment rate... increases in employment that barely keep up with the growth of the population." As a result, the unemployment rate has fallen only slightly over the past year, down from 8.1% in April 2012. The slow decline suggests "it will be many years until we see the Fed's 6.5% or anything like we had before the recession started," says Dickens, who's also a visiting scholar at the Boston Fed. The Federal Reserve Board has said repeatedly it would not abandon its near zero interest rate policy until the jobless rate drops below 6.5%. 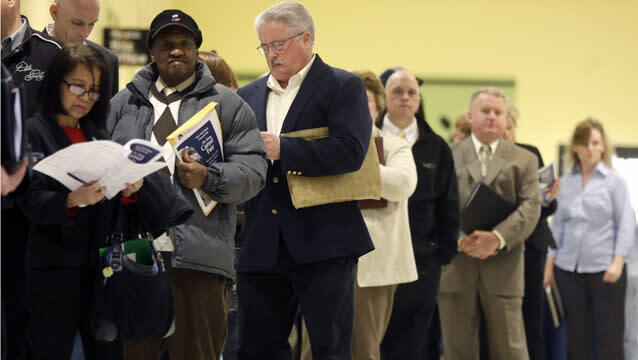 The latest report also showed that the number of discouraged workers fell to 835,000, down 133,000 from a year ago, and the number of long-term unemployed fell by 258,000. But that still leaves 4.4 million people unemployed for more than six months; they acount for 37.4% of the the unemployed population. It is particularly hard for those who have been out of work for more than six months to find employment, according to research from Professor Dickens and researcher Rand Ghayad. They sent out thousands of fictitious resumes for several hundred job openings listing experience, skills and time out of work, and found that the resumes showing unemployment for more than six months usually failed to get callbacks. Those resumes showing unemployment lasting less than six months had a higher rate of callbacks even if they showed NO experience in the field. For anyone who is unemployed longer than six months, Dickens recommends, "Get employment, any type of employment, so you can say, 'I had a recent job.'" He also recommends that policymakers in Washington focus on jobs rather than debt: "We've just made a very bad mistake in this country, and also in Europe, in concentrating on the debt rather than concentrating on the unemployment problem."